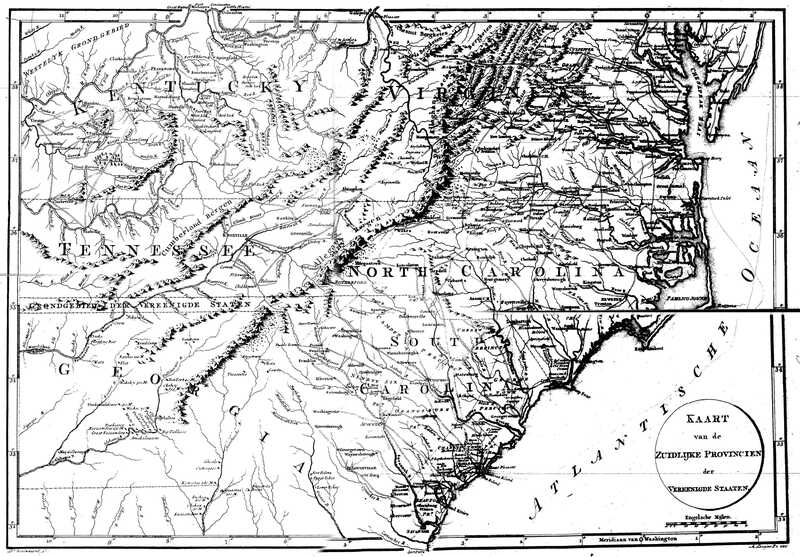 Although neither rare nor of great historical significance, a certain style United States regional map, centered on the Carolinas, captured my attention a few years ago after observing the remarkable frequency with which many of these maps were attributed to non-existent translations of a work by François-Alexandre-Frédéric, duke de La Rochefoucauld-Liancourt. These maps cover the Carolinas and portions of surrounding states. A distinguishing feature on each is an 11 mile wide strip of United States Territory between Tennessee and Georgia (Figure 1). Although both Georgia and South Carolina originally claimed this narrow band, Georgia relinquished her claim to this strip of territory as part of the boundary negotiations between the two states at the Convention of Beaufort in April, 1787. That strip of land was officially ceded by South Carolina to the United States in August, 1787, though the SC state legislature had approved the cession to the U.S. a full month before the agreement had been reached with Georgia! When Georgia ceded its western territories (essentially Alabama and Mississippi) to the U.S., the U.S. ceded a portion of the 11 mile strip to Georgia. François-Alexandre-Frédéric, duke de La Rochefoucauld-Liancourt (1747-1827) was a French social reformer who established a model farm, two factories, and a trade school on his Liancourt estate. He was forced to flee to England during the French Revolution and subsequently (1794-1797) traveled in the United States, reaching as far south as Savannah. Upon his return to France in 1799, La Rochefoucauld-Liancourt’s observations and experiences in the United States were published in Paris in 8 volumes under the title, Voyage dans les États-Unis d’Amérique, fait en 1795, 1796 et 1797. According to Sabin, the first edition contained 3 maps, as did an 1800 Paris edition. The first English translation of Voyage was also published in 1799, with the title translated and modified, Travels through The United States of North America, the Country of the Iroquois, and Upper Canada, in the Years 1795, 1796, and 1797. Sabin also indicates the presence of 3 maps in the London editions of 1799 and 1800, but not in the 1803 London edition. (Howes notes 1799 quarto and octavo London editions; all other editions are listed as octavo). Sabin also describes a German translation of the La Rochefoucauld-Liancourt’s work, published in 1799 in Hamburg, but no maps are indicated. Sabin does not list any other translations, and none could be found via Google search and various library and book search engines. Despite the absence of any known Italian or Dutch translations of Voyage dans les États-Unis d’Amérique, a commonly copied erroneous description on map dealer/auction web sites attributes maps of this style to an Italian or Dutch translation of La Rochefoucauld-Liancourt’s work. In the first French edition, La Rochefoucauld-Liancourt’s map of the Carolina region is titled Carte des Etats-Unis Provinces Méridionales (Figure 2) and can be found in Volume V of the Paris edition of his Voyage. The English counterpart is titled Map of the Southern Provinces of the United States (Figure 3). Over the next decade, and as late as the mid-19th century, at least 6 additional maps of similar design were published. Including La Rochefoucauld-Liancourt’s French & English editions, there were 3 maps with French titles, 1 English, 1 Dutch, and 3 Italian. These maps are similar, but not identical. The Dutch map, Kaart van de Zuidlijke Provincien der Vereenigde Staaten, appears to have been derived directly from the English map, while an Italian version, Carta delle provincie meridionali degli Stati-Uniti, most closely resembles the French edition of La Rochefoucauld-Liancourt’s map. Correct attribution for a map that has been removed from its book can be difficult since there is little to no publication information on the actual maps. Thus, one must find the map bound with its original work in order to confidently assign attribution. Further complicating matters is the use of one engraved plate to print the map for two separate French works. This information has been collected more by chance than by dedicated research. For example, all of the seemingly innumerable Italian editions of Botta’s Storia Della Guerra Dell’ Independenza Degli Stati Uniti D’America have not been reviewed. Since at least 3 4 different examples of this map exist in Italian editions of Botta’s work, it is possible that others exist of which I am not yet aware. Likewise, I have not reviewed the London edition of Marshall’s Life of Washington. Does it follow the Philadelphia edition which did not have a map of similar style to the one discussed here; or did it follow the French and Dutch editions of Life of Washington and include a map of this style? (UPDATE re: London edition (by Phillips, 1807) of Marshall’s Life of Washington… It contains a map from the same plate as the London edition of La Rochefoucauld-Liancourt’s Travels). Therefore, this data is presented as a starting point, and is offered with a desire for curious readers to provide corrections and additions. It is also presented with hope that proper attribution will be given to these various maps in the future. Botta’s Storia Della Guerra Dell’ Independenza d’America, published under various other titles, including Storia della guerra americana scritta da Carlo Botta, and Storia della guerra dell’independenza degli Stati Uniti d’America. The distinguishing features of these maps, including variations in title and publication source, are included in the following embedded document (for a better view, open in a separate tab/window via this link). Note: The blogger is indebted to Virginia collector and author, Bill Wooldridge, for bringing to my attention the presence of a third map titled, “Le Provincie Meridionali degli Stati Uniti”, which led directly to discovery of a fourth map with that identical title. Perhaps at some time in the future, we’ll determine the exact bibliographic origin for each of these nearly identical maps. I hope you aren’t holding your breath. Comments, questions, or corrections? Please use the “Leave a Reply” box below. Thanks! Hemperley, Marion, and Jackson, Edwin. Georgia’s Boundaries: The Shaping of a State. Athens, GA: Carl Vinson Institute of Government, 1993. Sabin, Joseph. A Dictionary of Books relating to America. Mansfield Centre, CT: Martino Fine Books, . Howes, Wright. U.S.IANA (1650-1950). New York: R. R. Bowker Company, 1962. This entry was posted in 18th Century, 19th Century, Boundaries, General or Reference and tagged A. Loosjes, Botta, Crevecoeur, La Rochefoucauld-Liancourt, Life of Washington, Pezze, Tardieu by crmaps. Bookmark the permalink.